First in this example we create a new class from Backbone.View. We override the initialize function. In the initialize function we log values to the browser console. My goal here is to show you what is available with a standard Backbone View. 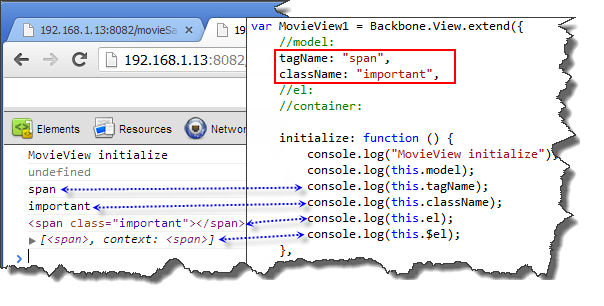 We can see when an instance of MovieView1 class is created called movieView1 that the initialize function is called. We are logging model, tagName, className, el and $el to the browser console. Understanding the term “this” is important. In the current implementation, “this” references the current view. In this example we are not using a model, so the value will be undefined. Majority of the time, a model will be passed to the view in it’s created. We will see this done later. The tagName is used to build the view “el” property. The “el” property represents the element that will be added to the DOM. The tagName is defaulted to “div” string. The className is also used to build the view “el” property. By default the className is undefined. In the code we can see that “this.el” represents an element with the tag “div”. It is quite common to use jQuery to manipulate the “el” property. So, Backbone.js includes a property called “$el”. This is a shortcut for “$(this.el)”. Now you have the ability to us “$el” and have all the methods and property that jQuery would provide. In this snippet of code, we can see that we assigned default values ot tagName and className. These default values are used to create the “el” property. Oh my, there’s a lot here. This is not as complex as it looks. First we create a Movie class based on Backbone model. The Movie class has default values and overrides the initialize function. Let’s skip to the bottom where the Movie class is instantiated. We instantiate a Movie class called “movie” and passed in the title “Lion King”. 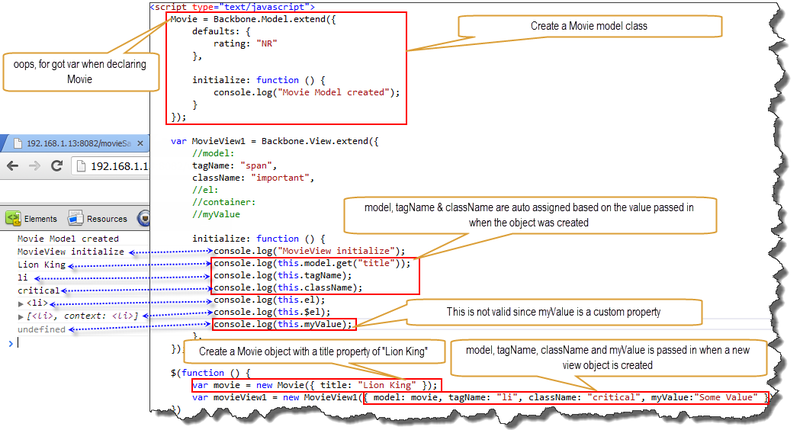 Next we create a movie view and provide values for model, tagName, className and myValue. In the results we can see that the movie model that we passed-in is assigned the to the property “model”. We can also see that tagName and className are also assigned to properties with in the view. But, myValue did not get assigned to the property in the View. Only ‘model’, ‘collection’, ‘el’, ‘id’, ‘attributes’, ‘className’, and ‘tagName’ will automatically be merged to the view. myValue will need to be accessed a different way. We will see this next. In this example we added options to the initialize function. Now we can reference custome values that are passed-in during the initialization. I added a HTML “div” element to the body. 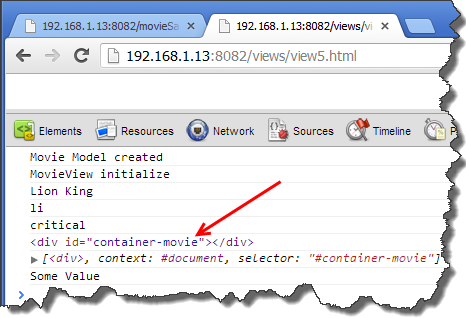 When I created the new movieView1 object, I passed in a reference to the new “div” element that I created. This reference is assigned to the “el” argument. As we can see, the “el” property of the view was assigned a reference to the “div” that was passed in through the initialization. The tagName and className did not have any effect on the “el” property. Since the “el” was assigned during creation of the movieView1 object, tagName and className was ignored. In the next post we will start rendering views. Love the way you describe everything. 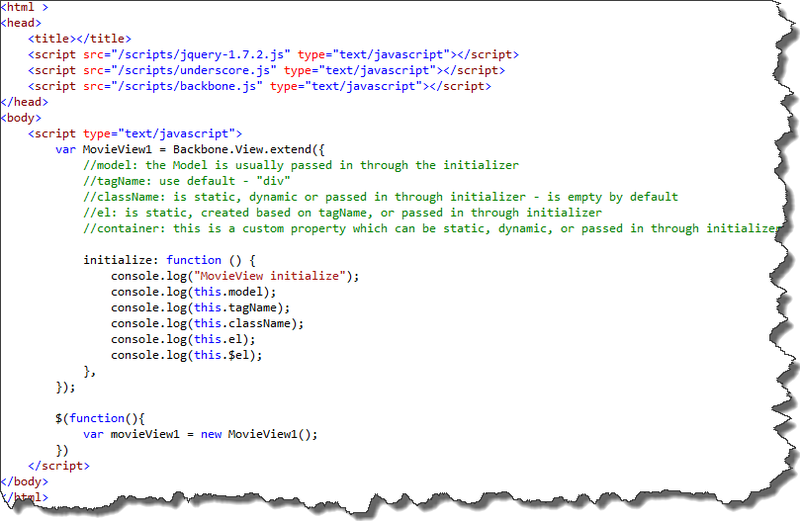 I’m using the backbone library that you use on the “simple example” of this tutorial (version 0.5.3), with jquery 1.7.2 and underscore v. 1.2.3. Thanks for the great explanation. I have been developing in backbone for the last week at work, but mostly just mimicking code from other devs while not knowing what I was doing. This is a great post!